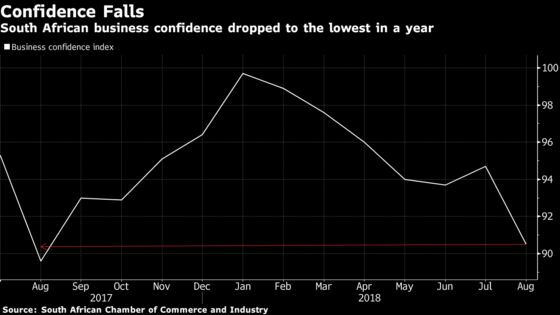 (Bloomberg) -- South African business confidence fell to a 12-month low in August, with the nation “losing its edge” as policy uncertainty weighs on economic prospects. The index decreased to 90.5 in August, the Johannesburg-based South African Chamber of Commerce and Industry said in an emailed statement Wednesday. Africa’s most-industrialized economy slipped into its first recession in almost a decade in the second quarter as President Cyril Ramaphosa tries to restore confidence battered by almost nine years of misrule by his predecessor. It also comes as the ruling African National Congress pushes changes to the constitution to make it easier to seize land without compensation and uncertainty lingers over mining rules that have hindered investment. The nation is the world’s biggest platinum producer. The rand has slumped 18 percent against the dollar this year, the worst-performing major currency after Brazil’s real, amid concerns about an escalating U.S.-China trade war and emerging-market risks. While exporters benefit from a weaker rand, this has weighed on the business climate, the chamber said. The gauges measuring exports, retail sales, inflation, metals and the exchange rate declined from the previous month, it said. The medium-term budget policy statement that Finance Minister Nhlanhla Nene will present Oct. 24 is the next big challenge for business sentiment and the currency, the chamber said. The government had tax shortfalls of 30 billion rand ($2 billion) and 49 billion rand in the past two fiscal years and said in February it will narrow the budget deficit to 3.6 percent of gross domestic product in 2018-19 from 4.3 percent last year.